Like no other officer in a generation, Gen. James Mattis has inspired those around him with his wisdom, candor and appreciation for rank-and-file U.S. service members. Now, he’s planning to retire, wrapping up a 41-year career in which he led Task Force 58 during the 2001 invasion of Afghanistan and 1st Marine Division during the 2003 invasion of Iraq. 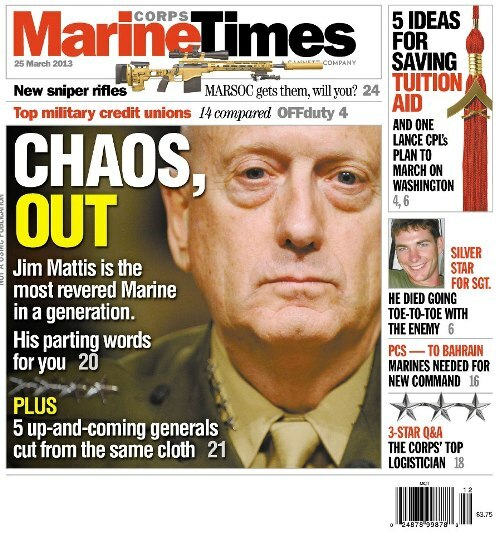 I examine Mattis’ place in history in Marine Corps Times’ cover story this week. The story is currently available online on Marine Corps Times Prime. Since 2010, the general known by the call sign “Chaos” has run U.S. Central Command, overseeing the war in Afghanistan and other U.S. military throughout the Middle East. He’s expected to be replaced by Army Gen. Lloyd Austin on March 22. Mattis himself weighed in for the story, saying in an email that he prefers to end his career quietly. We’ve got multiple anecdotes about Mattis that you’ve likely never heard before, thanks to interviews with Gen. John Kelly, Brig. Gen. Paul Kelly, Col. Mike Groen and others. A source also shared details about a closed-door all-hands meeting in which Mattis spoke at CENTCOM headquarters at MacDill Air Force Base on March 8. Was there a new “Mattisism”? Of course there was. Again, the story is online here. MAN of his Caracter today even at my age. An Old Korean war era Marine. God Bless you General Mattis and God Bless the Marine Corps. I served with General Mattis in Afghanistan as part of Task Force 58. He was no doubt the finest Marine officer I have ever had the pleasure of serving with. One of my biggest regrets is not re-enlisting at Khandahar International Airport and having him do the honors, I no doubt would have been along with him in Iraq. I did receive the Navy and Marine Corps Achievement Medal awarded directly from him and is one of my proudest accomplishments while in the Corps. Congratulations of the highest acclaim. Well done Sir. Please be our next President. God Bless you and yours, General!